Video games often use parallax scrolling technique to create an illusion of depth by moving multiple layers of images at different speed. This technique can also be applied in web design. This post consists a list of mind blowing parallax scrolling sites, design tips, and resource tutorials. If you are considering to start a parallax scrolling site, this is a must read post. 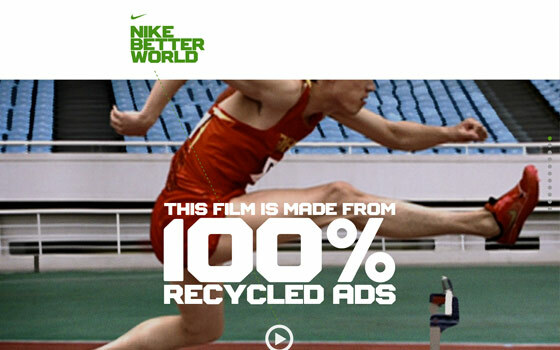 Nike Better World is probably one of the early sites who started this parallax scrolling trend. Still looking good. 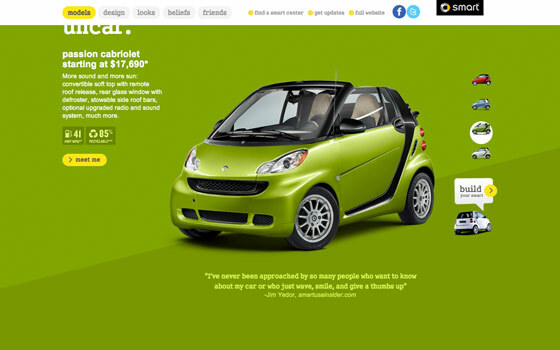 As you scroll down the Smart USA site, the elements zoom to you. What is really impressive is they managed to maintain the similar look and feel in their mobile version. Most parallax scrolling designs don’t play well on mobile devices. Having a separate version is a smart idea. 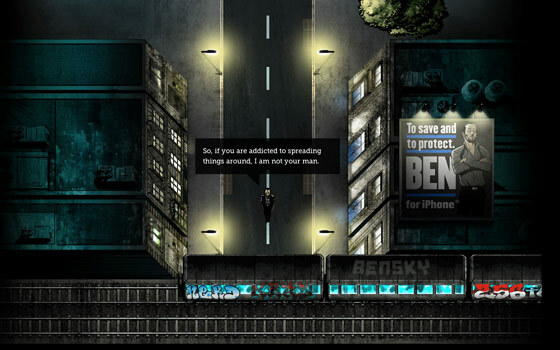 Although the perspective seems very wrong (it doesn’t feel like a bird’s-eye view) on Ben The Body Guard, but having a character and trian runs across the scene is pretty cool. I don’t understand Dutch, but browsing on Laurentius site was very enjoyable. You can scroll through the slideshow with mouse scroll wheel, scrollbar, navigation buttons, or arrow keys. I particularly like the slide between 4 & 5 where the butterflies flew out the scene randomly. 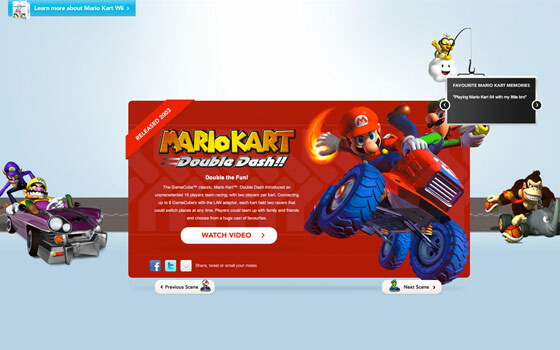 Mario Kart site gives you the same kind of experience as if you were playing on the Wii. It is fun to see the carts move on the track. Notice when you try to scroll down on the last slide or scroll up on the first slide, the graphic elements shake to create the effect of braking. 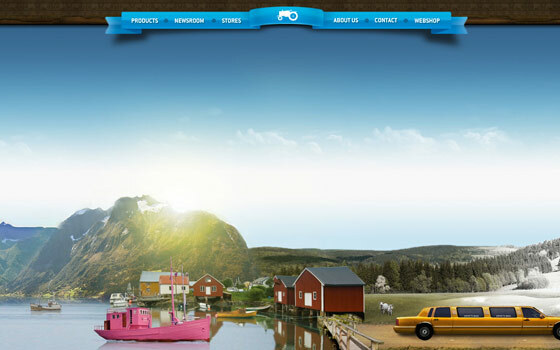 Moods of Norway truely depicts the beauty of a city line in a parallax scrolling tour. It takes you from the country side to the urban city in different lighting and season. I thought it is a travel site, but it turns they are a product site (LOL). Don’t forget to check the site on your iPhone. It displays a sweet message when you are viewing in portrait mode. You can swipe through the scenes in landscape view. 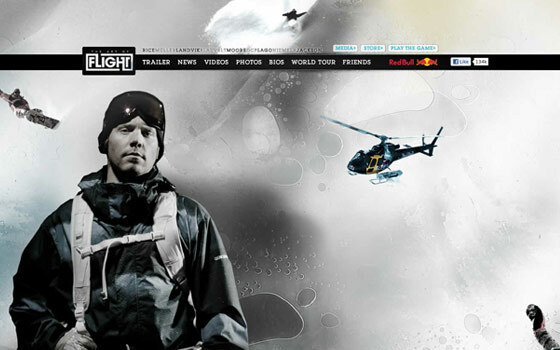 Like the Mario Kart site, Art of Flight provides the same experience as if you were flying in a helicopter. It gave me a headache (in a positive way) from watching the elements flying around the scene. Very well done! Beside the parallax scrolling on Smokey Bones, I like the bottom of the site where you can break the balls and play pool (well, sort of). 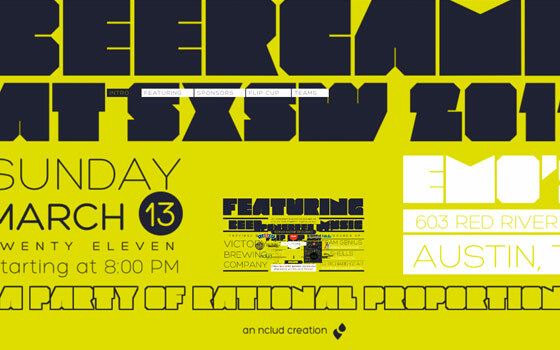 BeerCamp doesn’t have the stunning images like most of the parallax scrolling sites, but it is very well executed. Everything is laid on the screen. As you scroll, the design zoom in layer by layer. Make sure you are on high speed connection to check the Beetle site because it is very graphic instense. The scrolling at the beginning is put together with image by image like keyframe animation. 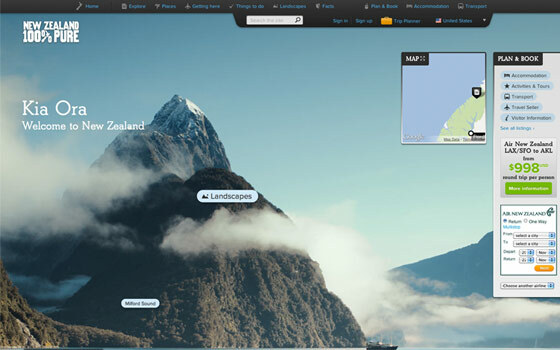 The scene design on the New Zealand site is breath taking — beautiful and high resolution imagery. However, this beauty costs some load time and graphic resources. 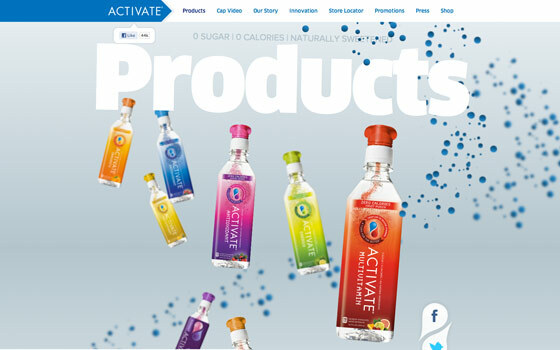 Among all the sites on this list, I think Activate Drinks has the best pre-load idea. First it shows you a nice loading animation and then the cap on the bottle starts turning as you scroll. 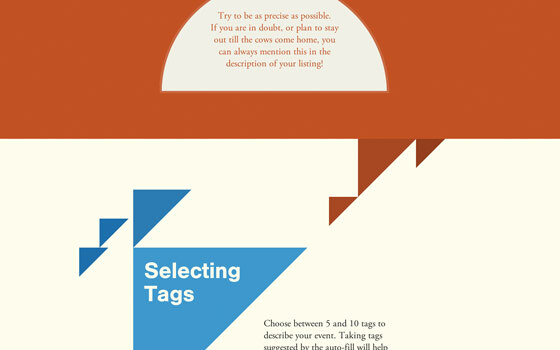 This "Making the Perfect Listing" page is nicely put together with just basic color and shapes. Scroll and watch the shapes merge together. Preload the graphics: if your design is very graphic instense, preload the graphics before loading the site. This will give the user more seamless experience. Mobile devices: pay extra attention to mobile devices because users might not get the same experience as the desktop browsers. Viewport sizes: be sure your scene works on various viewport sizes (small, medium, large). Lastly, I would like to say thanks to all my followers @nickla who tweeted me some of the parallax scrolling sites. That is nice man. Great job! Die Seiten von Smart und Art Of Flight gefallen mir. Incredible. It’s hard to choose a favourite. We’ve been in awe of parallax scrolling since we got our hands on “Shadow of the Beast” on the Amiga! Nice set of sites! I too have created a set for parallax scrolling sites. Nice collection of Parallax Scrolling Sites .Thank you. 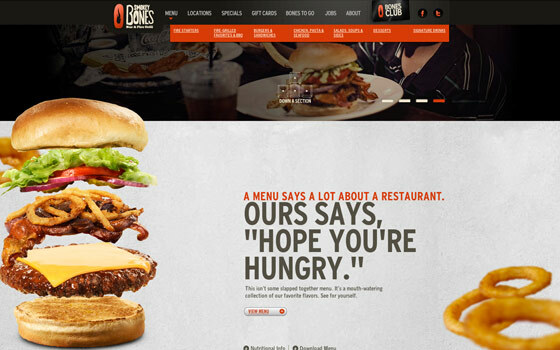 Gotta say I love the Smokey Bones website the most. Pretty much every element of that site I like. The others are great too, but that one was nice. The is the actual promotion of the new CITROEN DS5 which very good website in all modern aspects: visually and technically (HTML5, CSS3, Responsive Design, Vertical Parralax). Take a look on the massive usage of CSS-Skew. We had fun making the many layers move and spent a good bit of time with the easing effect to have all the items ease into and out of place on the page. Great list. I’ve seen most of them but discovered a few new ones as well, love it. Now I’ve got something to play with this am. Can’t wait to start implementing this…. One site pages are probably not that great for search engines either. They look cool though. Makes me want to play super mario and the Smokey Bones site makes be want a cheeseburger! Cool examples but not totally convinced about this technique though. Just incredible levels of expertise and creativity displayed on those links. Lots of interesting techniques used and food for thought. Genuinely have just had my ‘mind blown’! Nice collection. Just built my first parallax scrolling site. Inspired most by Art of Flight, this was a project for Subaru. http://www.subaru-global.com/11la Would love to get your feedback. I appreciate the concerns about a one-page site, especially for SEO. Though there is no reason you couldn’t have lower-level pages with or without the parallax. Googlebot sees the no-JS pre-enhanced version so there’s plenty of content to chew on. It’s also nice to see what happens when SEO isn’t the primary consideration. Great examples and will be implementing this technique. What about mobile devices? I tested them all on an ipad, none of them seems to work, or give alternative static layouts. I really would like to see this work on an ipad. Maybe somebody can post some examples of that? Cool new effects out there :) I toyed around on a mini portfolio I whipped up for job interviews (see link at username, won’t spam it). Out of four companies where I applied, all four offered me the job. Great technique to impress people with rather easily. Would really recommend it! As for the pre-loading: that’s nice, but at the very least give the visitor an idea of how much data you’ll be pushing through; in bandwidth-capped situations you might not be too happy with 10 MB’s worth of car pictures in all different colors. Giving them a way to cancel the process and watch a low-fi version of the site is probably a good idea. That said, pretty things ARE there to be viewed! These are REALLY great sites. I just tried to experiment the Parallax scrolling effect as online portfolio. Its mostly based on Nike Better World. Thanks for this , and inspirations. very nice collection and tuts. Most interesting stuff I’ve seen this month. Nice work. Aha, but only to reach this degree talent (said with much admiration). I love Mario Kart site! Very complex and super sweet looking. cool. i hadn’t seen the Gidsy one before. I like it. Some really well designed sites there. The Nike and Ben the Bodyguard ones are favourites. There are some I haven’t seen before as well. Good job. That Nike Parallax Scrolling Ad was great! Just implemented a similar function into one of my clients websites. I have been meaning to implement this inot my website but haven’t found the time. soon enough i will, but until then check out this css tricks article on the same subject very interesting work. thanks. This was really inspiring, thanks alot!!!! This was really inspiring!! Im def. gonna use these for future projects. Surreal… the concepts in these designs are AMAZING!! The Mario Kart site was truly amazing. Huge attention on the details to (scroll wheel navigation, deep linking, video pausing). Really inspiring and a truly amazing work. Does anyone know which agency did it? yes really inspiring, its helpful. Thanks for posting, these are very inspirational. I appreciate the concerns about a one-page site, especially for SEO. Though there is no reason you couldn’t have lower-level pages with or without the parallax.Lots of interesting techniques used and food for thought. One of the greatest things about this is that if you enter the Dutch site into google translate ( http://translate.google.com/translate?sl=auto&tl=en&js=n&prev=_t&hl=en&ie=UTF-8&layout=2&eotf=1&u=http%3A%2F%2Fwww.laurentiuswonen.com%2Fjaarverslag2010%2F&act=url ), almost everything gets translated into English! Deep thought! Thanks for contriubnitg. Love the post, i really like the “Laurentius” website…rocks!! would be interesting to learn how to build these! Very interesting article! Alot of people spend their time just looking for the DoFollow links but in reality you can benefit from both NoFollow links as well. That’s totally mind blowing website. Love the design and the effects of parallax. This work absolutely mind blowing website. I am in Love with these designs. The effects of parallax is awesome. These are fantastic examples of parallax scrolling. Very impressive. This is interesting example of parallax scrolling!!! Really impressive post.Many Thanks. Really impressive post. Thanks for that..
Really nice post! 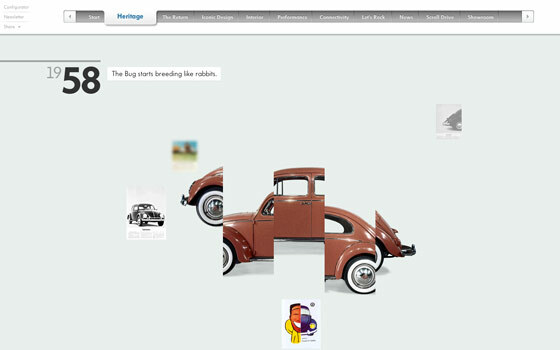 Really interesting webdesign technology! I see a lot more sites using this feature when I am browsing the web and it is a feature I do like. I feel that it gives the site an extra feel to it and you feel as the viewer and user more involved with the site. This is a great collection you have put together and I really like the Beetle site. I love how as you scroll the years pass and the image slides and changes. I found myself scrolling for ages just to take the little bits of the site in. Great post and I look forward to more from you. Not sure what happened to Moods of Norway, but it looks nothing like the screenshot you provided. Bummer too because I was looking forward to reviewing it. Some amazing designs… love this!! There are lots of cool animations and features to the site. Watch the flying airship fly by as you scroll up or down. Thanks for sharing, it was a great info for me, Really thanks a lot…. Art of life looks smart and inspiring. New Zealand site rocks! The beetle is also awesome ! ! ! ! The main image size is the most impotant thing…. These websites are pretty amazing and the extra layering seems to really pay off in terms of creating a wow worthy website. This article has provided me the information that i was seeking.. Thanks for the blog.. It’s awesome. We think we did a pretty good job. Its not perfect but most parallax scrolling site do not have SEO. And very few SEO Agencies have parallax scrolling sites. We have yet to find one. Let me know if you do. I am speechless after watching the parallax scrolling sites. These are no doubt simply mind blowing. Specially Mario kart is awesome to scroll down. Yes! I do remember that Nike Ad scrolling type! Like some kind of videogame in the 80’s! LOL!